Place eggs in pan and cover with cold water. Boil eggs for 5 – 7 minutes. Meanwhile, slice black olives in half the long way. (End to end; not sideways) Keeping one olive half whole, slice the other olive half into slices for the spider legs. Cool boiled eggs in water and peel. Be careful to keep eggs smooth as you peel away the shells. Slice the eggs the long way. Empty yolks into a bowl. Add mayonnaise, vinegar, mustard, salt, and pepper to yolks. Mix yolk and ingredients well. Fill the holes in the egg where the yolk was with the new yolk mixture. Place half of the black olive on top of the mixture. Use the slices of black olive to make six legs with three on each side. That’s it! 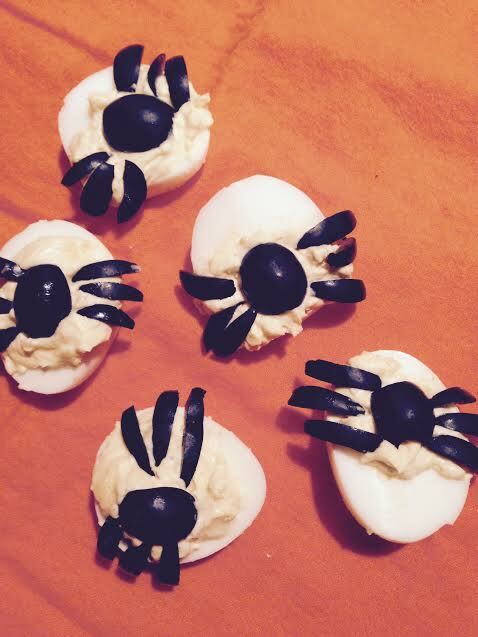 Refrigerate until ready to eat and watch your guests as they shriek over these deviled spider eggs! I found some small plastic containers with covers at a dollar store. Having many young nieces and nephews who love to go trick-or-treating, I was prepared to hand out these Halloween Spiders. The cups were perfect for transportation; although several were eaten before they left. All of my trick-or-treaters laughed! Initially, some thought the spiders were real. Easy solution. I ate a few to show they were just olive spiders on deviled eggs. This recipe is the perfect ‘trick’ and ‘treat’! Check out our Halloween Crafts and Recipes page for more ideas! 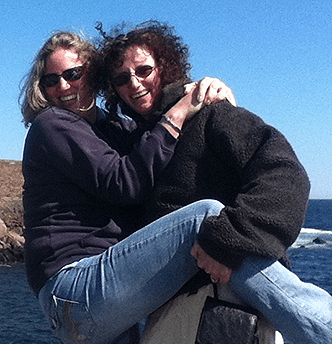 If you haven’t yet, like us on Facebook for more great recipes and crafts!